Answering TTP Thrombotic Thrombocytopenic Purpura: Congratulations to the Answering TTP Partner’s for Life Team! Congratulations to the Answering TTP Partner’s for Life Team! 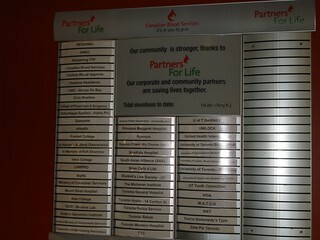 Together our Partner’s for Life blood donation team contributed 90 blood donations in 2012! Congratulations to all team members and all those who have actively recruited family and supporters to the team. Ninety blood donations is a great start for this program. What is even more exciting is the number of first time donors that come out as part of the team and continue to become regular donors. Did you know that young donors who are successful in giving 3 times are very likely to become regular donors? As the average age of blood donors increases, recruiting new young donors is becoming increasingly important. Delta Kappa Epsilon, University of Toronto fraternity, is doing their best to give back and engage their young members to become regular blood donors. 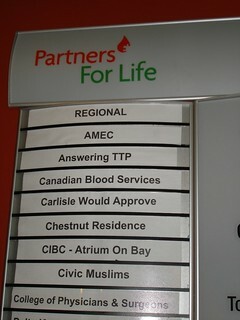 The fraternity is a reliable participating partner in every In Honour of TTP blood drive to date. The Foundation extends our appreciation for their extraordinary dedication. Delta Kappa Epsilon, University of Toronto fraternity, partners for TTP Blood Drives! We still have a lot of opportunity to grow the team’s contribution. 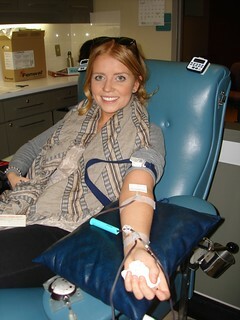 Blood donations are an integral part of TTP treatment. The amount of donated blood required for each treatment for a TTP patient depends on the size of the patient and response rate to treatment. 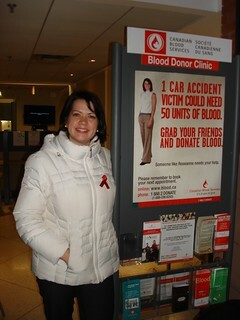 Personally, I have received about 10 blood donations per treatment. Since 2008, I have received almost 60 treatments which translates to donations from approximately 600 donors. I am only 1 TTP patient. There are about 150 cases of TTP diagnosed per year in Canada. The 90 donations we raised this year, is only about 80% of the blood required to treat 1 of my relapses; only 36% of the blood required to treat my initial TTP crisis; and only about 15% of the blood I’ve required for TTP treatment to date. Tammy, Stephanie and Jeanie enjoy the BEST cookies! Let’s double the donations in 2013! Please help recruit more members to our team. TTP patients are encouraged to recruit their family and friends. Existing team members are asked to consider bringing a friend or co-worker the next time they donate. Still not convinced? Giving blood is the best excuse to refuel with cookies! Visit www.AnsweringTTP.org to join the Answering TTP Partner’s for Life Team!